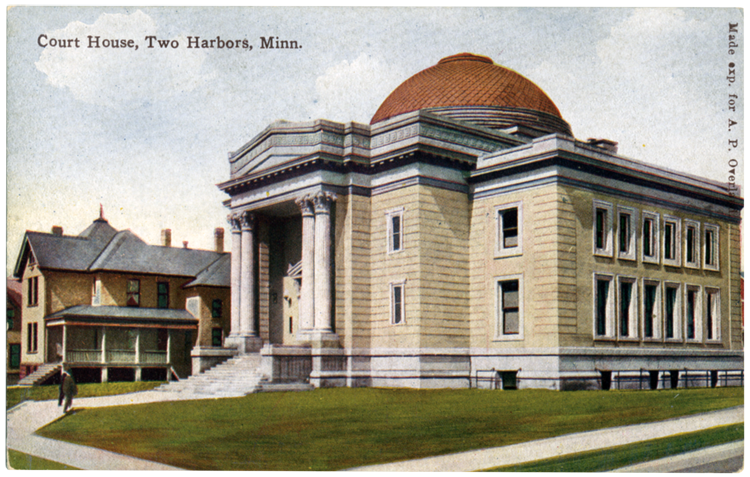 In 1888, four years after the Duluth & Iron Range Railroad Company turned Agate Bay into an iron ore port, the Lake County seat moved there from Beaver Bay. A two-story Queen Anne courthouse was built and served the county until 1904, when it was consumed by fire. Two years later architect James Allen MacLoed’s Beaux Arts Courthouse—built of brick and stone and topped with a fish-scale-patterned dome—stood completed at 601 Third Avenue. The open dome sat over the courtroom, but it caused acoustic problems and was closed off in 1945. Artist Axel E. Soderberg of Odin J. Oyen, a Lacrosse, Wisconsin, decorating firm, was called in a year after the building was complete to create a mural of “Law & Justice.” He also executed three other murals representing commerce, mining, and forestry. Major restoration projects in the late 1990s and 2002 brought the building back to its original grandeur, even uncovering skylights long hidden by suspended ceilings.